Luckily, SERVPRO has the trained technicians and the equipment to salvage a soaked hardwood floor in the Century City area of CA. The expense to replace is prohibitive, but we can save the boards by placing drying mats to pull out the water and hidden moisture in the tongue and groove joints. Count on SERVPRO to save you money and aggravation. Don't let your Westwood property fall victim to fire damage. 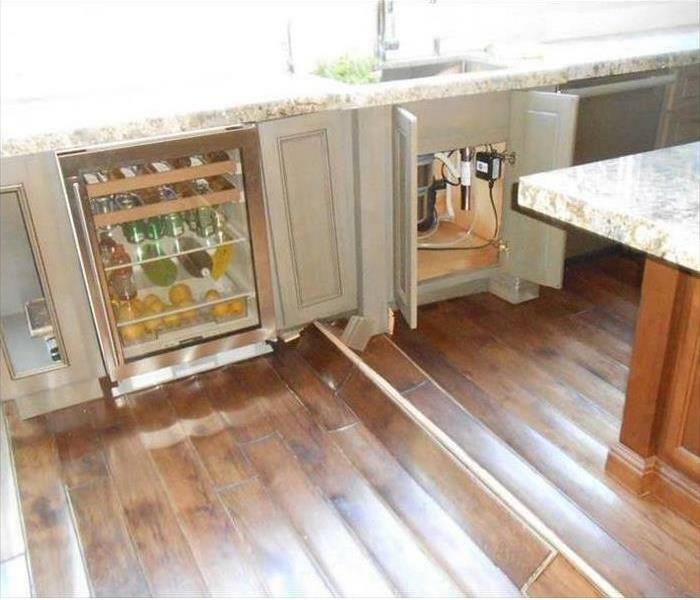 You need to call the experts at SERVPRO immediately. Our highly skilled technicians are ready 24/7 to respond to your emergency. SERVPRO of Beverly Hills / Westwood has the training, experience, and equipment to restore your home in Westwood to pre-damage condition. 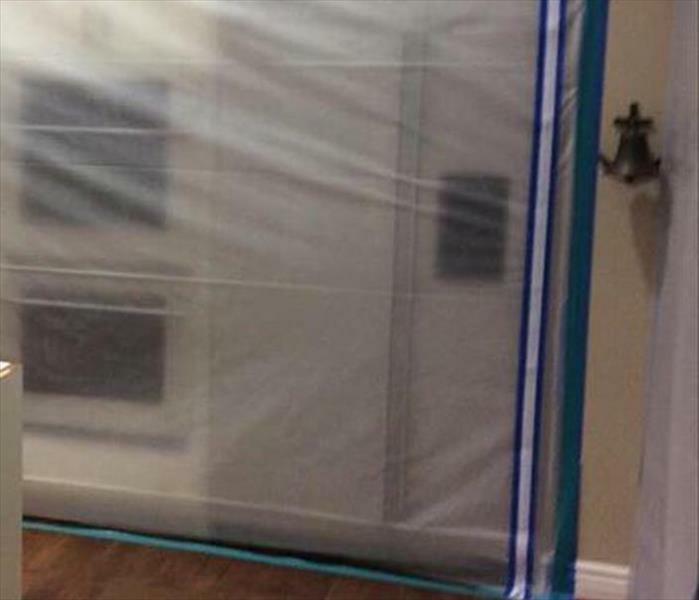 Why hire a company that may spread mold spores to unaffected rooms of your Beverly Hills home? Let SERVPRO professionally set up a containment barrier, then remediate the mold, "Like it never even happened." You will be happy you did! When your residential property experiences a fire damage emergency, you can count on the team at SERVPRO to help you. We can answer your call 24/7, and our team can handle any size disaster. SERVPRO of Beverly Hills / Westwood has the equipment, training, and experience to restore your home to pre-damage condition. 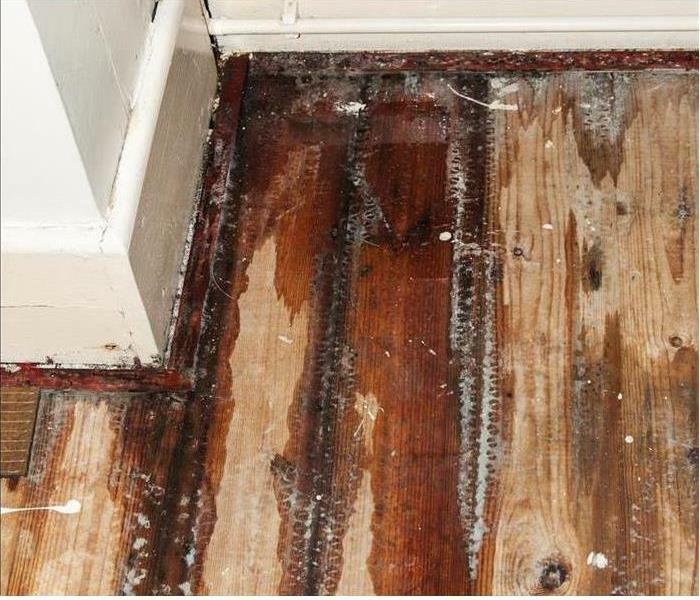 The leak from the cooler in this Century City home led to buckling of the hardwood floorboards. 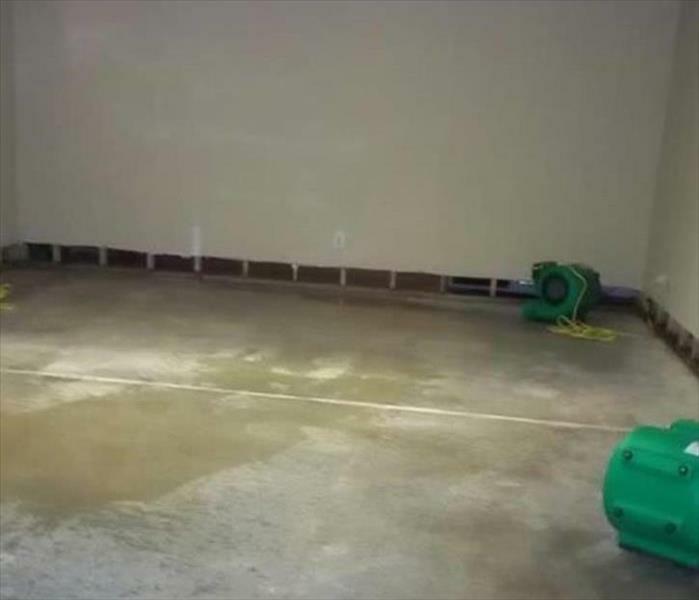 If SERVPRO techs are called in to evaluate the water damage and plan a course of recovery, we can guarantee that a practical and economical outcome can be achieved. Our training and equipment, backed by a dedication to our customers, means we make them feel "Like it never even happened." Storm damage in Beverly Hills can be quite extensive, and we consider these large loss events. 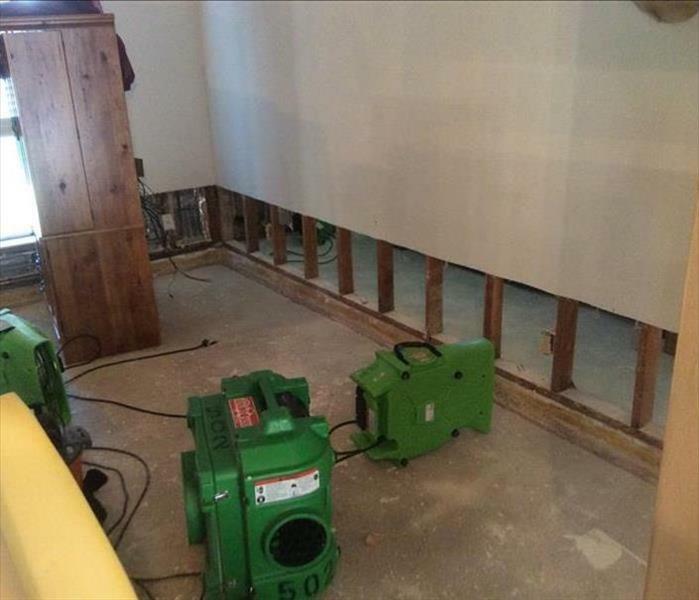 Specialized equipment is called for to mitigate water damage from a large loss storm event. Pictured here is a large commercial desiccant dehumidifier which forces hot, dry air into water damaged structures to help dry the building. The water drip encouraged the growth of mold colonies in this Beverly Hills home. 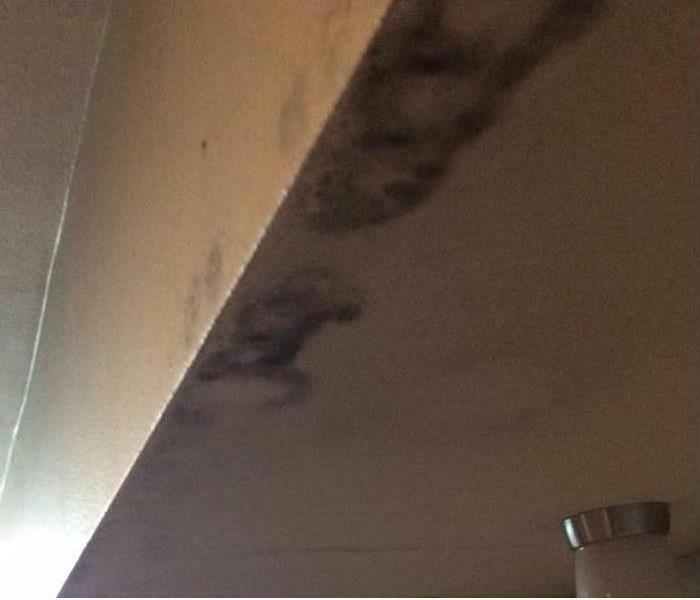 The stain from the mold growth was unsightly, emitted a foul odor and weakened the ceiling. Our SERVPRO crew removed, disinfected, and replaced for a typical mold remediation service. 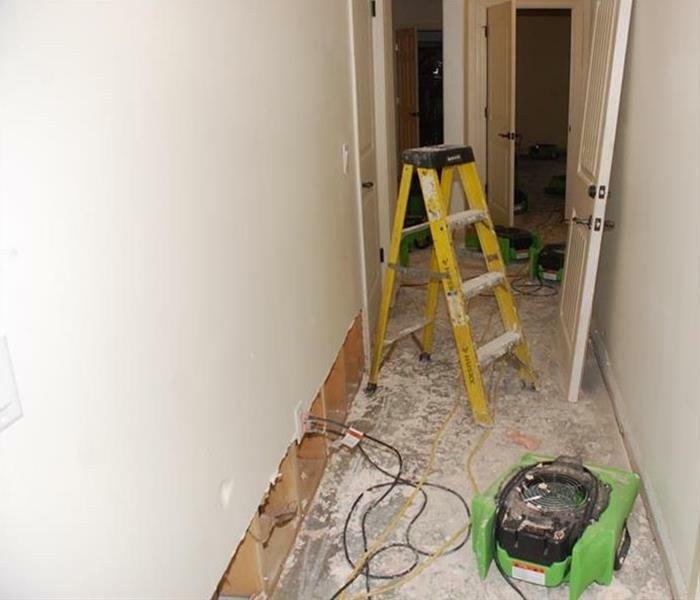 Commercial water damage struck this Beverly Hills office when a water line ruptured during the night. By morning, when it was discovered, quite a lot of water had accumulated. SERVPRO of Beverly Hills / Westwood was called to clean up the water. WE responded immediately. When we arrived, we extracted the water and then set up commercial air movers and dehumidifiers to aid in the drying process. 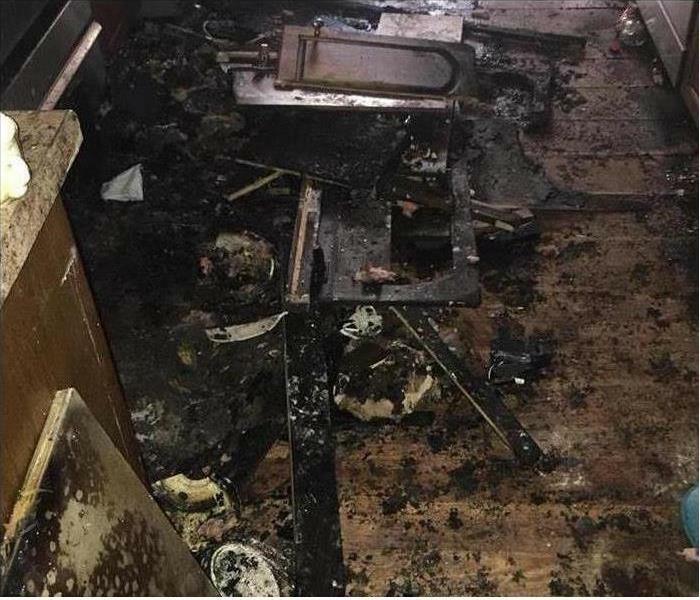 Fire damage in this Bel Air kitchen destroyed the room. We cleaned up all of the fire damaged materials and disposed of them properly and extracted the water damage from the firefighting efforts. Our project manager planned the rebuild of the kitchen in conjunction with our clients and their insurance adjuster. The rain water from the sudden storm in Bel Air flooded this building. Pictured is a room after the removal of the soiled and contaminated carpeting. The 12-inch cut-out of drywall panel allowed for access and drying to the wall cavities. Our equipment is still in the process of restoring normal humidity and moisture levels. 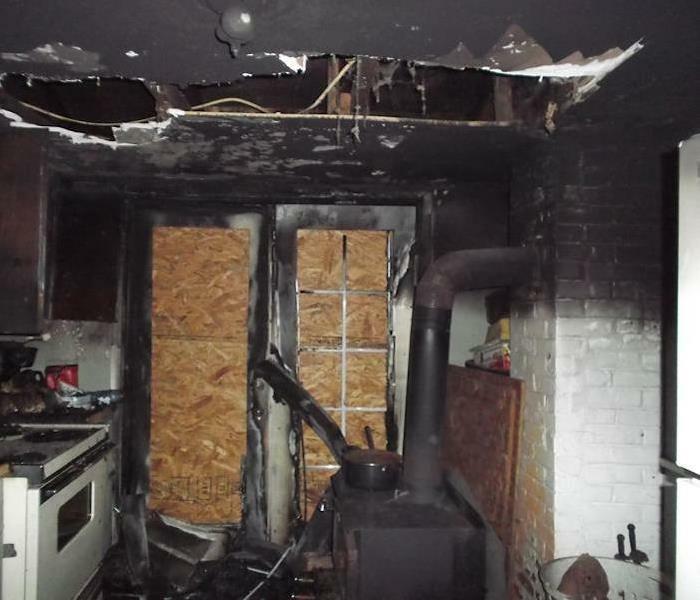 The grease fire in this Westwood kitchen devasted this room of the home. 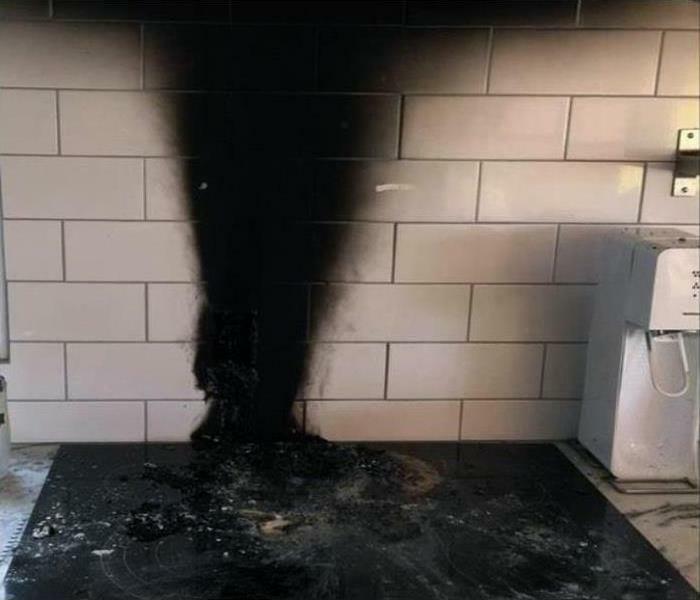 It is important to prevent the oily soot from circulating to other areas of the home. Smoke damage is often more troublesome to correct than the fire cleanup. In this case, a partial demolition of the kitchen and barrier assembly to stop the odors was the initial service. SERVPRO gets it done right. 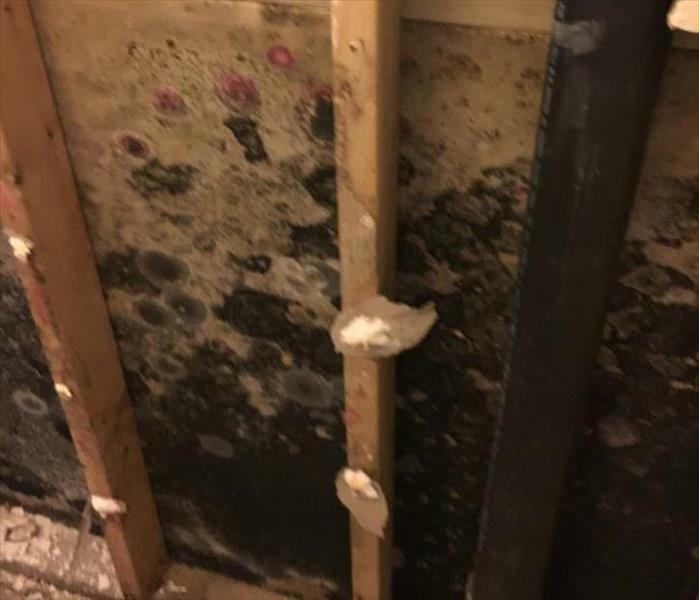 A basement bathroom in a Westwood home was seldom used, so the mold growth went unnoticed for quite some time. 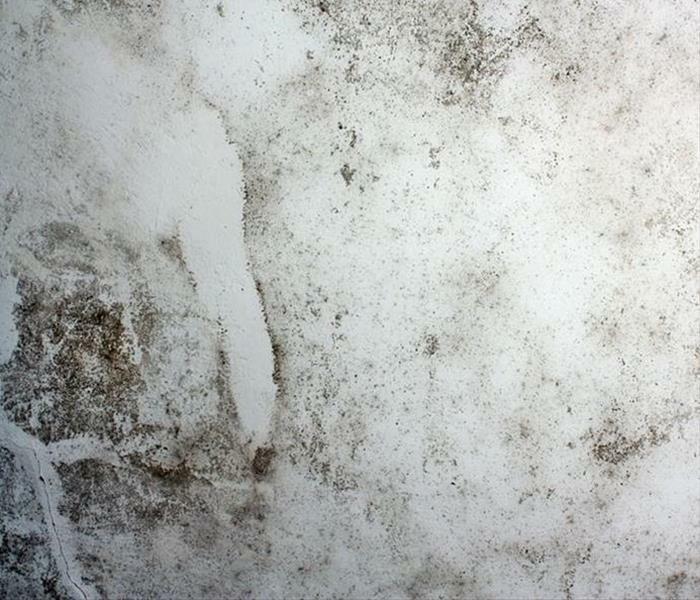 The mold patch which is illustrated in the wall cavity generated that foul, musty odor, which was mostly removed along with the non-salvageable drywall. SERVPRO technicians can rebuild the wall with new paneling after treating the affected area with antifungal agents. 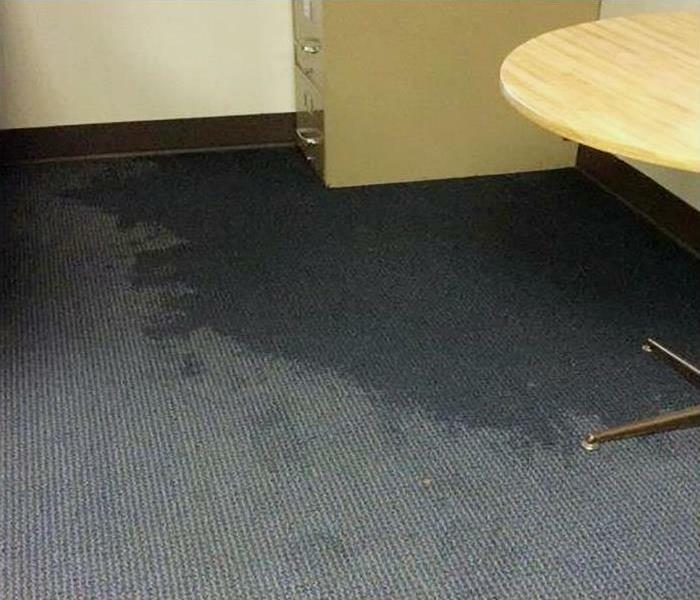 When commercial water damage occurred at this Beverly Hills Library, the SERVPRO team was called in to clean up the water. We dispatched a crew, and they arrived at the site within an hour of the call. 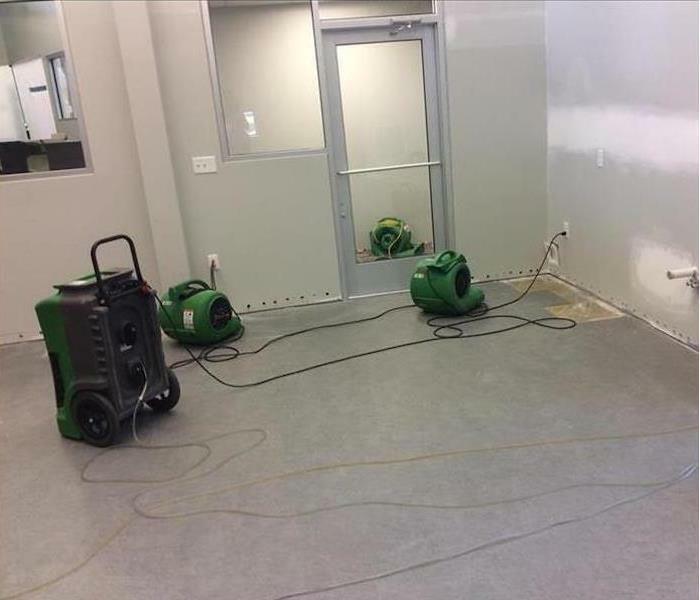 The photo shows the drying phase of the project with air movers and dehumidifiers at work. 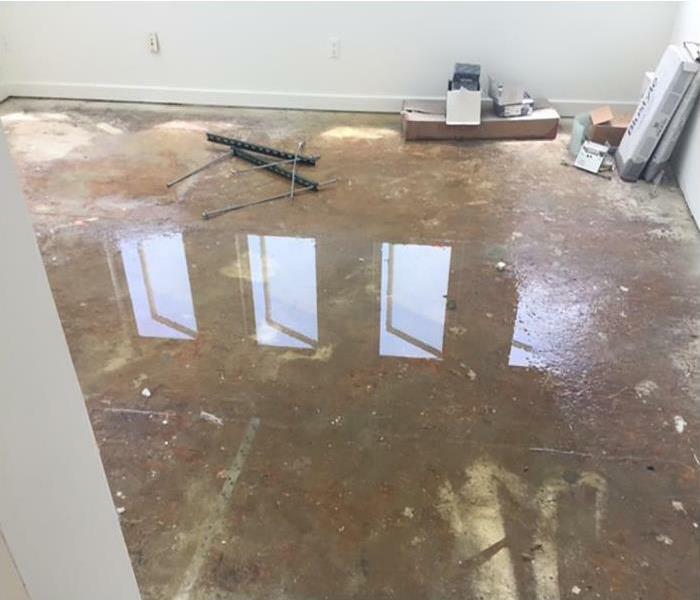 Water damage in Beverly Hills not only damages physical property but often important and valuable contents become moisture laden. Technology to deal with such loss has come a long way. 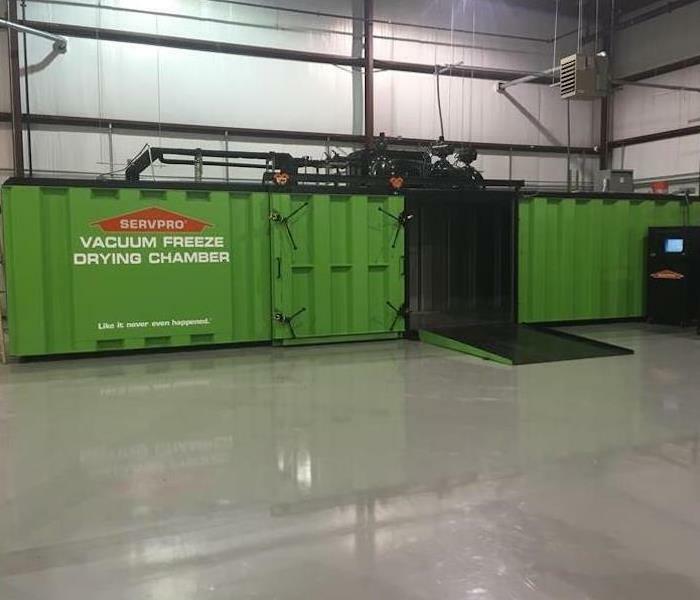 Pictured above is the latest state-of-the–art Vacuum Freeze Chamber. Books, documents, and artwork can be treated and restored using this high-tech equipment. The quicker this process is performed, the better the results are. 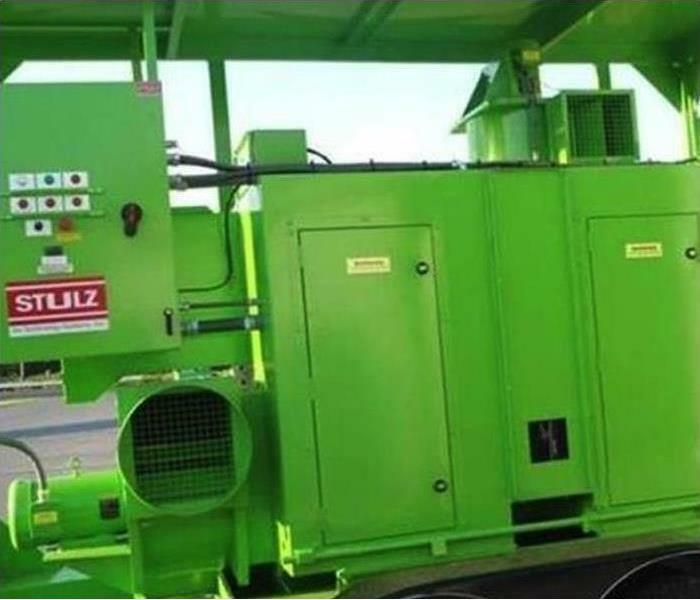 To that end, this unit can be mounted on a trailer and transported to the loss site for more immediate restoration of damaged articles. Fire damage to the Los Angeles Citibank building on South Beverly Drive brought 120 firefighters to put out the fire and SERVPRO of Westwood-West Beverly Hills to clean up the water damage and smoke damage that remained after the blaze was extinguished. The photo shows our crew hard at work using the latest equipment and procedures available for fire and water damage restoration. If your business is interrupted by fire damage and you need a first-class job performed in record time, call SERVPRO of Westwood-Beverly Hills 24/7 at (310) 390-7540. 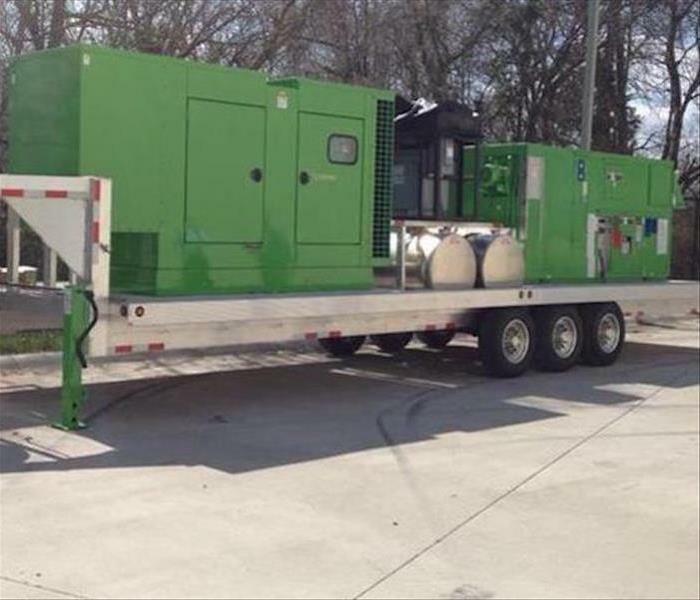 We have the equipment and personnel available for any size emergency. Water damage at Beverly Hills came from a roofing leak caused by a band of powerful thunderstorms. 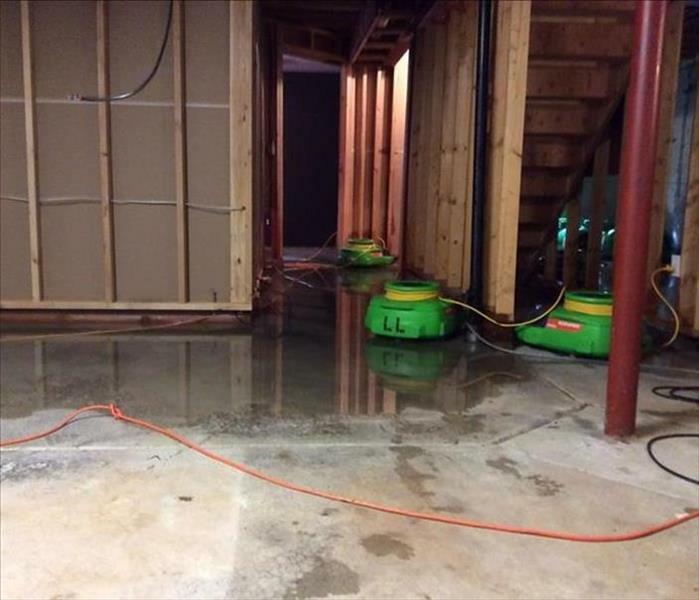 SERVPRO was called, as the water built up on the floor was still getting deeper. WE dispatched an emergency team to locate the source of the water and to prevent it from causing further harm. We carried out the water clean up an id the necessary repairs to the roof and ceiling. 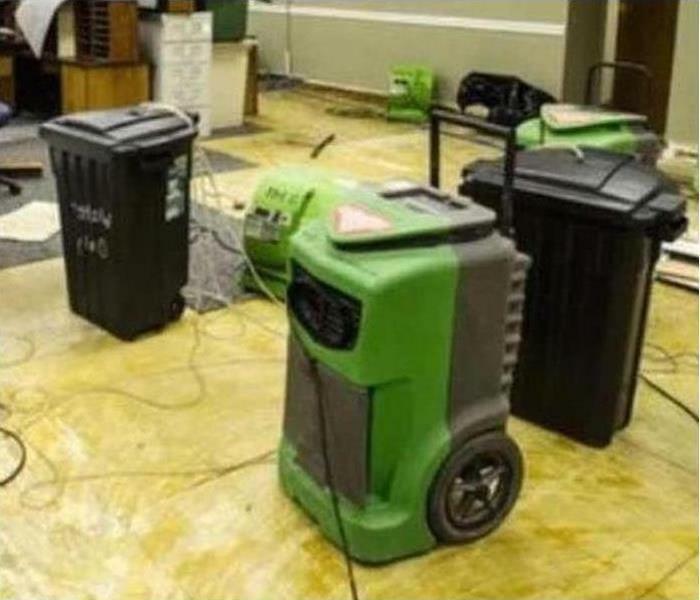 If your business faces with water damage, and you need to get back to business fast, call SERVPRO of Westwood – Beverly Hills 24/7 at (310) 390-7540. 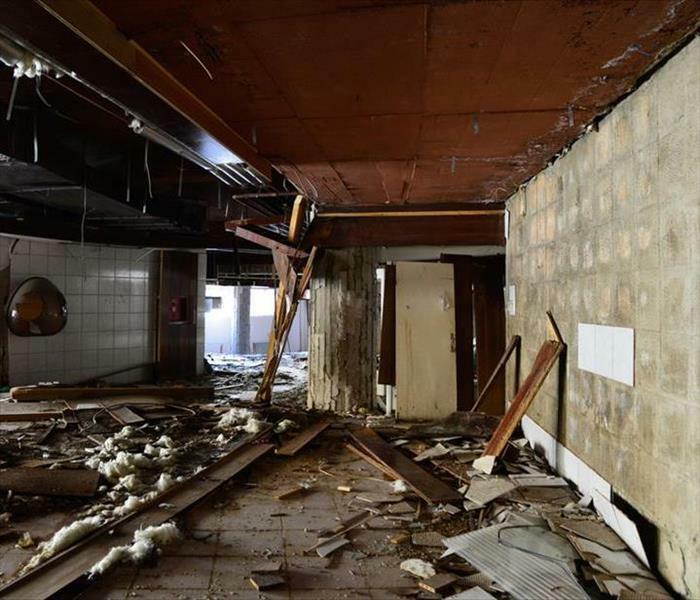 Flood damage at this Westwood office building spread over four thousand square feet with floodwater sludge. SERVPRO was the only choice to mitigate this damage. Ours was the only inventory of equipment available to dedicate immediately to this project. Floodwater extraction was the first item on the project plan. Once that was complete, the drying along with the removal of debris followed. 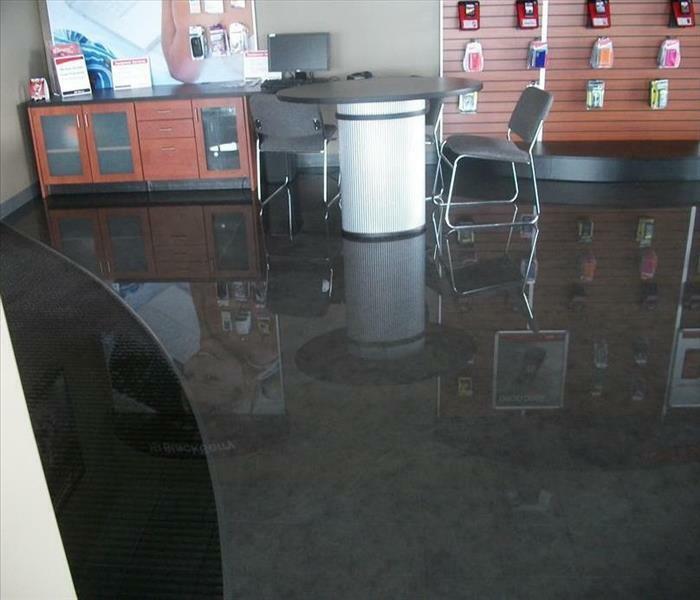 Flood damage disrupts normal business operations causing hardship for customers and employees. Call SERVPRO of Westwood – Beverly Hills 24/7 at (310) 390-7540. We have 24-hour emergency service. 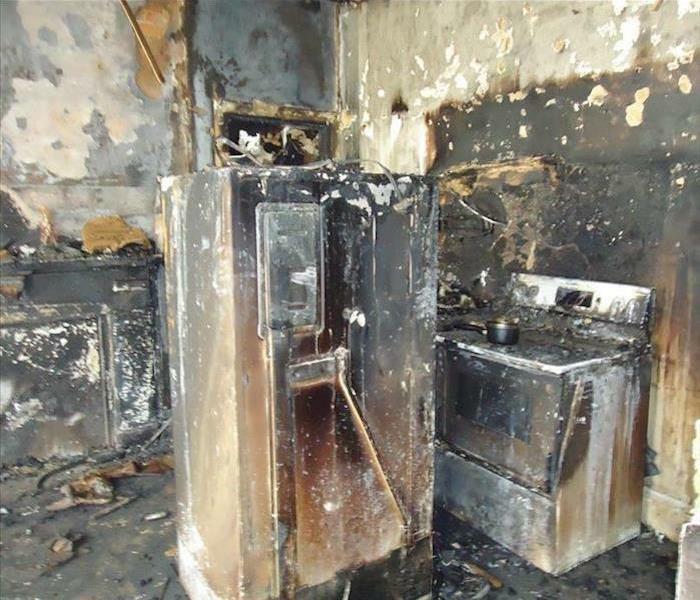 Fire damage at this Los Angeles home started with the faulty wiring of a kitchen appliance. The home suffered extensive fire and water damage. The photo shows how destructive the fire was. This project was not a clean and rapid restore. It required tear out, and removal of a broad array of fire and smoke damaged building materials and debris. 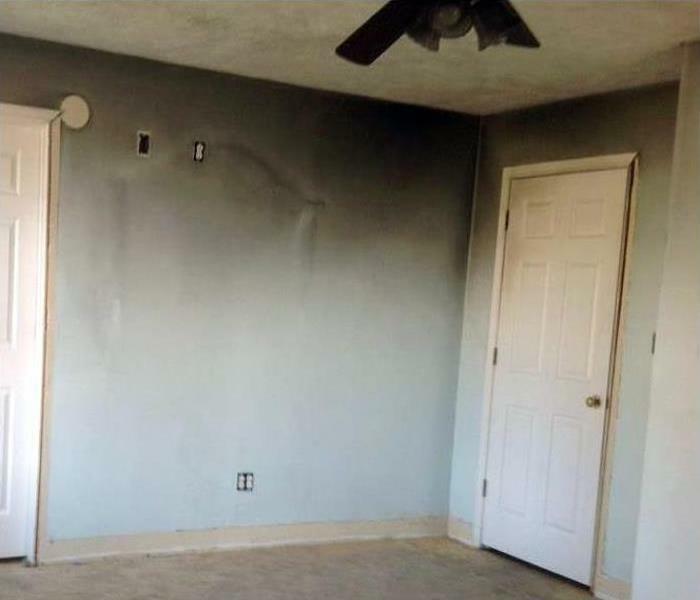 The rebuilding project lasted for four months but when finished it was “Like it never even happened.” If you encounter fire damage of any degree, call the professionals at SERVPRO of Westwood – Beverly Hills 24/7 at (310) 390-7540. 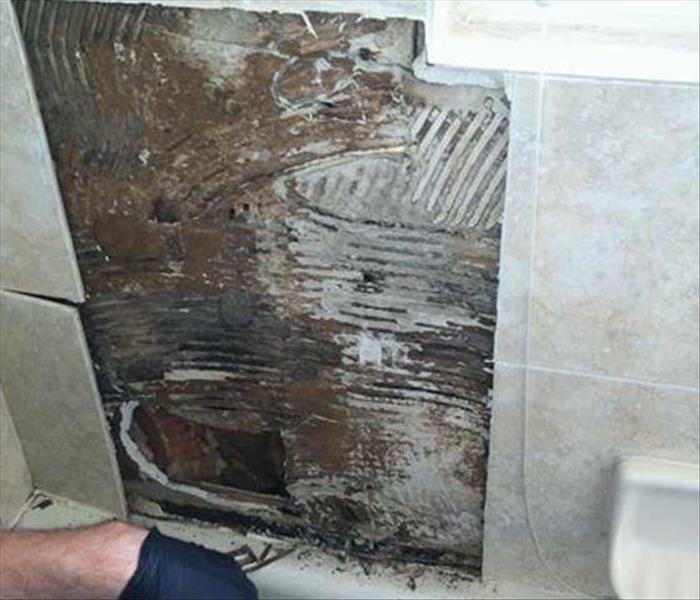 Mold damage at this Beverly Hills home was noticed when the edge of a tile appeared to have mold or mildew on it. 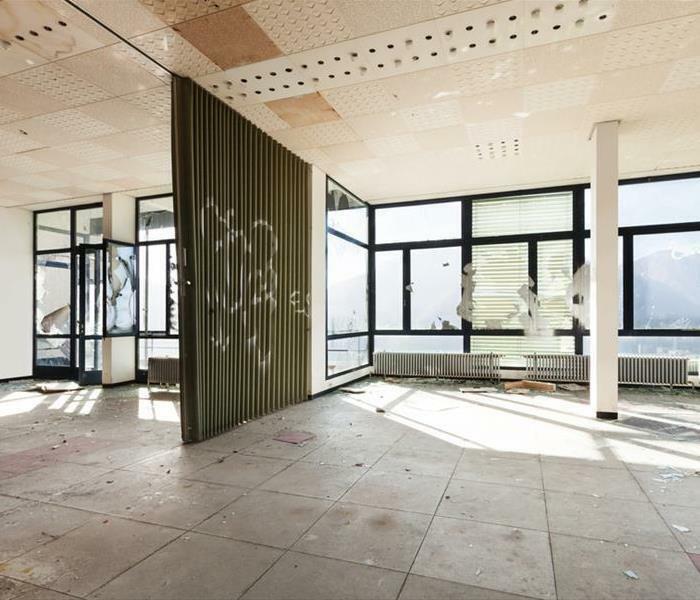 Infestations can become quite sizeable in just two to three days, so it is imperative to investigate as quickly as possible. SERVPRO of Westwood -Beverly Hills know the science of mold. 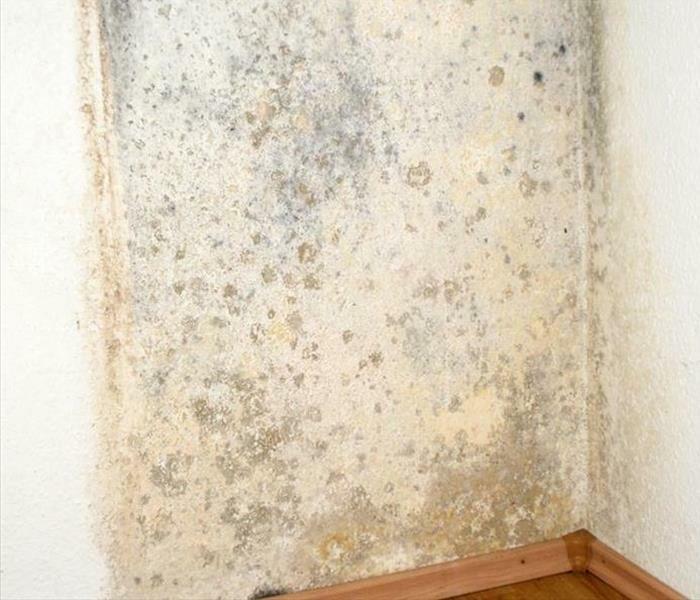 You can count on us to remove your household mold and restore a fresh smell to the air in your home. Just call us 24/7 at (310) 390-7540. Storm damage in Westwood can require specialized equipment. SERVPRO prides itself on being able to provide the best engineered, most up-to-date equipment for our customers. Our goal is to be the most efficient and cost-effective disaster restoration service available. If storm damage leaves you in need of restoration services, call SERVPRO of Westwood -Beverly Hills 24/7 at (310) 390-7540. The mold grew on this wall because the humidity was consistently above 45%. Technicians must use approved EPA clothing and gear when dealing with large mold infestations. The antifungal application is an important facet of the mold remediation in a Beverly Hills Home. 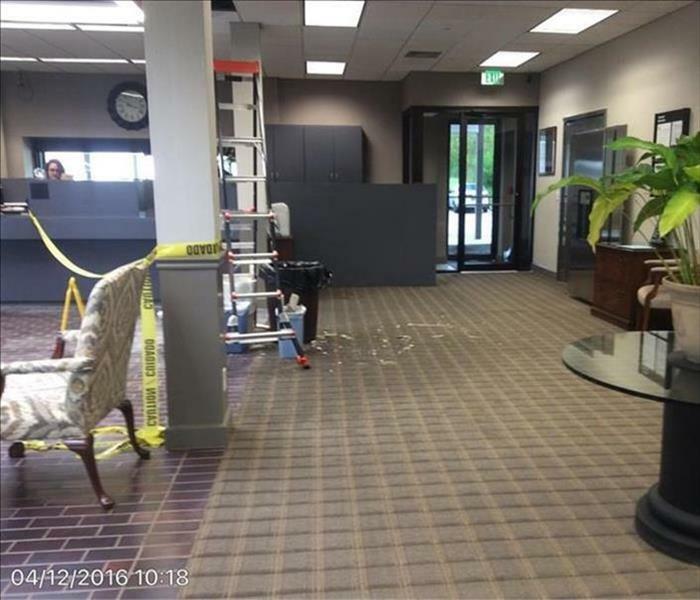 After the roof leak caused water damage to this Beverly Hills Bank, several ceiling panels had to be discarded and replaced. We worked around the customer traffic to successfully repair the roof damage and to dry out the carpet. The flooding caused by the storm provided damage to this Beverly Hills Home. Rapid placement of the water extraction and moisture capturing equipment mitigated the damages and the homeowner was very pleased. The ceiling tiles leaked water down to the floor from a roof opening. Some work was done to dry out the building in preparation for a new business that was moving in. 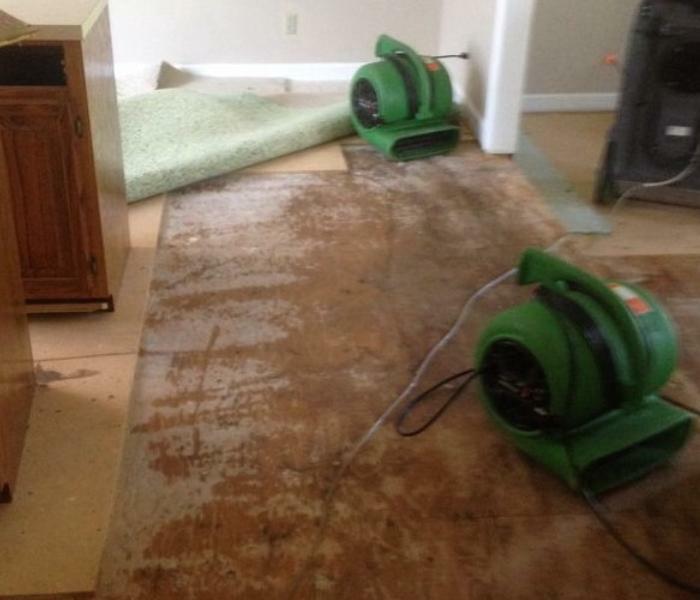 SERVPRO worked swiftly to remove all traces of water and moisture. Eliminating excess moisture is the surest way to keep mold growth at bay in Century City. HEPA filtration systems, and correct cleaning and disinfecting of the HVAC unit and ductwork also helps the indoor air quality. 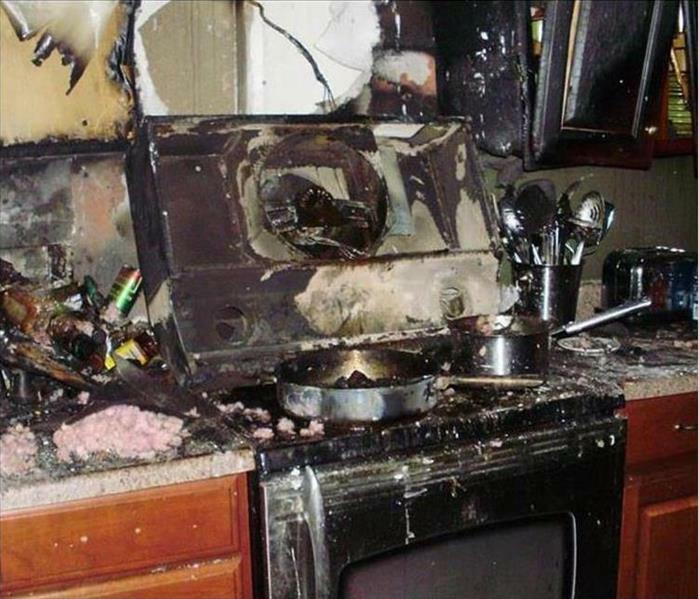 We realize the disruptive nature of a non-functioning kitchen because of fire damage. This Los Angeles home's family was at a loss but we assured them we would do our best to consider their needs and feelings and restore their home as soon as possible. "Like it never even happened." The water rushed in through the broken window and drenched the walls and carpeting causing a lot of storm damage in the Los Angeles bedroom. We removed some of the non-salvageable drywall and dried the place out. Then we continued with the restoration. 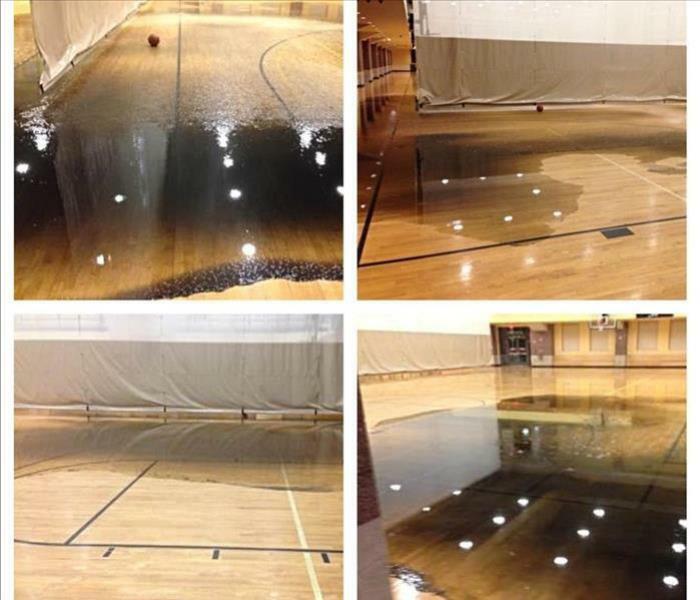 When a restroom sewer line backed up, Black Water was deposited on the gymnasium floor. It was critical to safely remove the grossly contaminated water and to also secure the hardwood floor from sustaining expensive damage. This small Westwood hotel suffered water damage when the sprinkler system activated because of a malfunction. 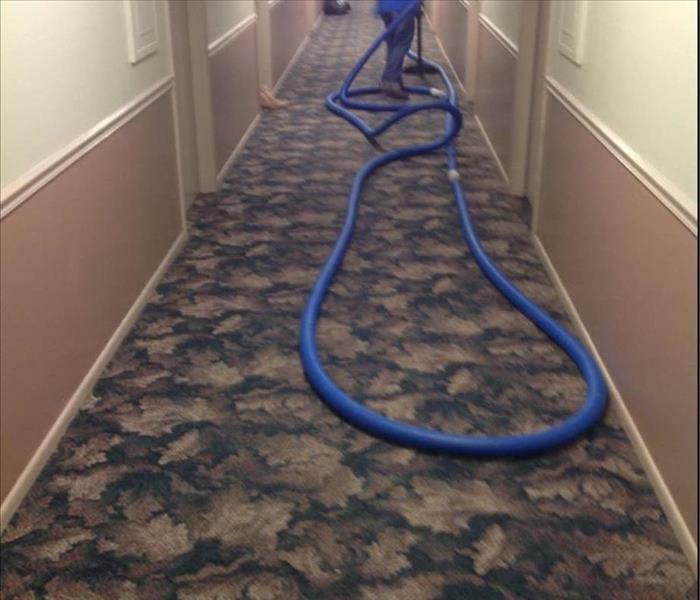 Our job was to limit the water damage by extracting water from the carpet and to protect the walls from wicking water. We Are Faster To Any Size Disaster. This utility area and storage / garage was damaged by a Westwood fire. The charred debris had to be removed before any restoration work could be started. We have the certified technicians to accomplish the task to completion. "Like it never even happened." 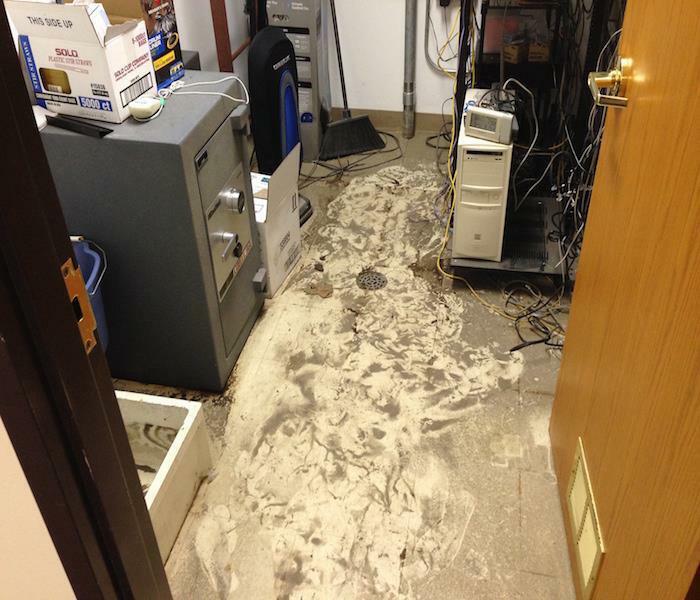 The clogged HVAC caused standing water to collect and dampen the carpeting. The quick removal of the water helped to diminish the water damage in this Westwood home and preserved the laminated sub-flooring. 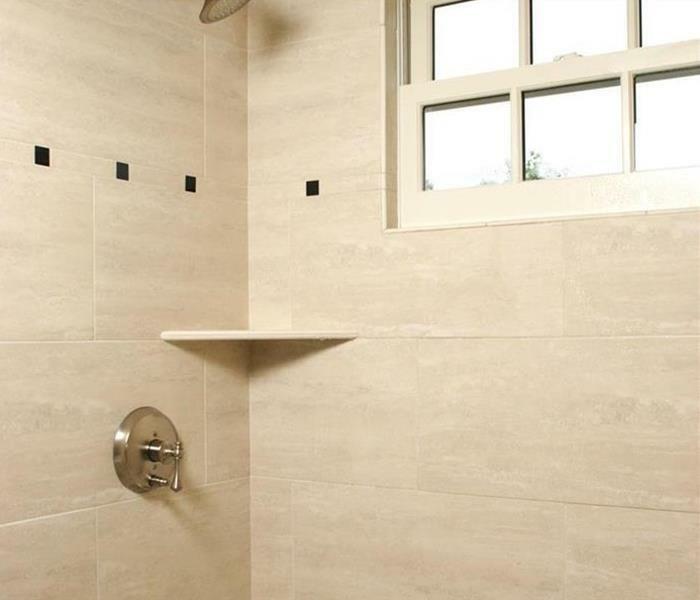 This bathroom was remodeled after mold remediation had made the area safe again. The owner wanted a nice private zone for his guests and we at SERVPRO were happy to start the remediation and follow it through to the finished product. This flooding left a deep layer of water on the flooring. 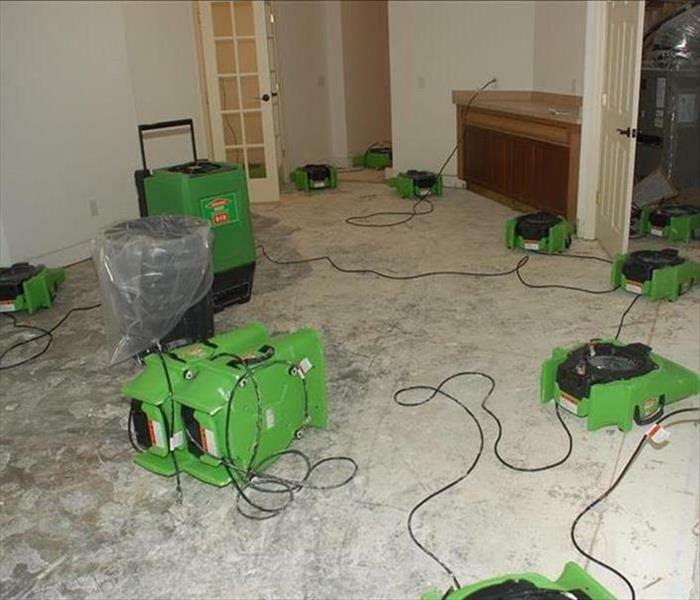 SERVPRO techs placed a large amount of air movers and dehumidifiers to increase the rate of evaporation to mitigate storm damage to this Westwood property. When the water pipe ruptured within the wall the drywall was water damaged. This Beverly Hills owner wanted the drywall cut out and discarded to be replaced with new material. The area was thoroughly dried prior to the installation.